Denise Gallant and Kevin Monahan fell in love at KZSC. But the radio station, and Kresge College, also gave them the skills that built their careers. By including the college and the station in their will, they’re able to make a gift well above their annual donation. KZSC, where hundreds of students have learned broadcasting (and other life skills) has passed the half-decade mark. In 1976, when it was only a few years old, Gallant (Kresge ‘76, individual major) and Monahan (Kresge) had backto-back shows on Friday nights. Their young romance grew into their decades-long marriage. Their time at UC Santa Cruz was transformational for them. In Kresge’s Town Hall, they experimented with technologies they would both use in their careers. Gallant became a video producer, Monahan an audio engineer. Regular donors for years, they now are making an even bigger difference by including KZSC and Kresge in their will. Read more about a fundraising effort for KZSC and the Cantú Center. Whatever your passion, you can help it live on. 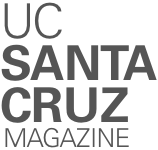 Find out how to include UC Santa Cruz in your estate plan. Please contact the Office of Planned Giving at (831) 459-1045.